#stampinup A good friend is retiring this week. I'm excited for her--she has so many adventures ahead of her. But, I'm a little sad for myself. I'll miss our end of day chats. I'll miss traveling with her. I'm hoping that we will keep up with each other as she steps into her new life. Of course, I've made a card for her to tell her how much I'll miss her and wish her the best. In fact, I bought the "Wild About Flowers" set specifically because it contains a retirement sentiment. My friends at work and I are all nearing that time in our lives and I wanted to have a stamp set with nice words to usher my friends into the next stage of their lives. I searched Pinterest for some ideas and I saw this wonderful card by Dawn Olchefske and knew I would CASE it. Dawn's work is always so pretty and I often find myself being inspired by her. I added a few of my own touches--but my card is very much inspired by Dawn. I started with a Crumb Cake panel and used my Simply Scored Board to score three lines horizontally near the center. I wanted there to be a bit more space at the bottom so I could fit in the sentiment. I stamped the sentiment in Basic Black Archival Ink, and used my Stampin' Pierce Mat to ensure I'd get a good impression. I wrapped two lengths of Linen Twine just under the scoring before adhering this piece to a Basic Black mat. Then I adhered this to a Crumb Cake card base using Stampin' Dimensionals. Dawn used all three flowers from the "Wild About Flowers" set for her card. I was too lazy to do that, so I used the same image. The stem is stamped in Old Olive onto Whisper White and the flowers are Daffodil Delight, Pumpkin Pie, and Melon Mambo. I punched the flowers out with the 1-3/8" Circle Punch. I adhered the stamped circles onto just larger circles of Old Olive that I cut using the Circles Framelits. I adhered these to the card using Stampin' Dimensionals. For a final touch, I tied a bow of Linen Thread onto the strands of thread I'd already added to the card. 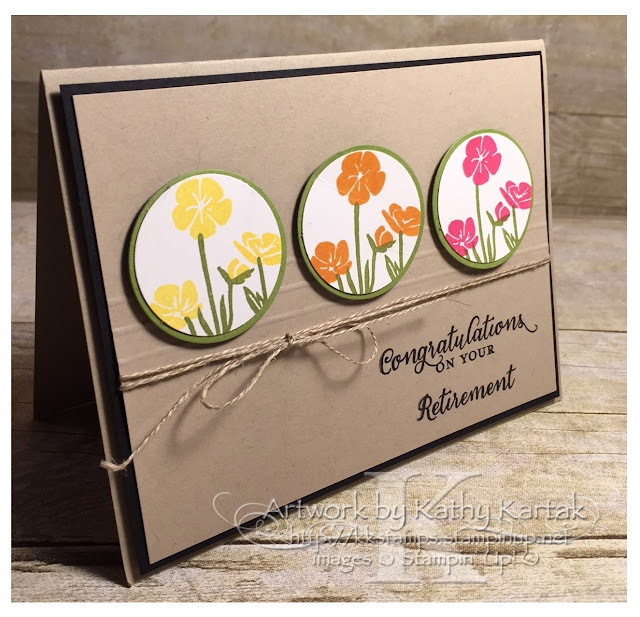 Dawn's design is so cute and it was easy to make a quick, but sweet, retirement card for my friend.